This typewritten letter was sent by R.M. Allan, Warden of Kingston Penitentiary, to the Assistant Director of Internment Operations, on February 27, 1941. 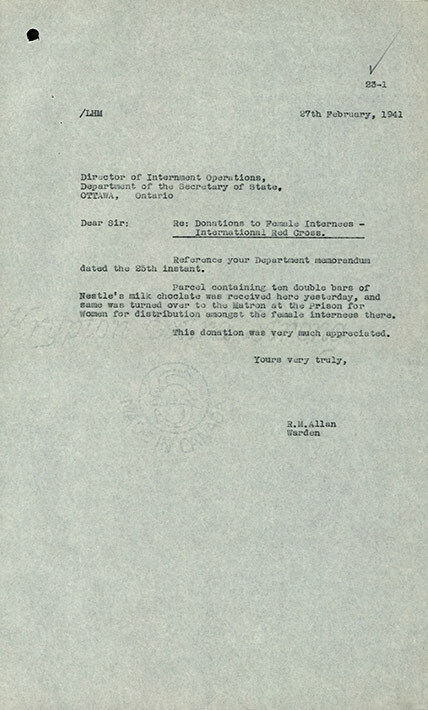 This letter follows on other correspondence pertaining to a donation of chocolate bars by the International Red Cross to female internees (see LDICEA2012.0017.0006-7). Four Italian Canadian women were interned during World War II. They, along with 17 German Canadian women, were held at the Prison for Women in Kingston, Ontario. The prison was located on the north side of King St. West, across from the Kingston Penitentiary. The women were held in a separate wing known as the Internment Quarters. Women internees could receive letters and care packages. At the date of the memo, February 27, 1941, only two of the Italian Canadian internees remained: Verna Lo Bosco and Maria Pressello. Their signatures appear on the memo of 12 names giving thanks for the donation (see LDICEA2012.0017.0006).